It's hard to get inside the mind of a toddler, but one thing is for sure - when they don't like something, they make sure you know! Problem is, they don't like a lot of things, especially the ones we as parents think they should do - such as staying clean and healthy. You can't easily change their mind, but here are five things you can expect strong resistance to. 1. Cleaning and grooming - Toddlers will play happily in the water, until you want to give them a bath or clean them up. Then, water is their enemy. And why is it always a struggle to get them out of dirty clothes and diapers? Because they just couldn't care less about cleanliness and hygiene. Asking to brush their teeth elicits a full-on tantrum. 2. Sitting still - No one expects them to sit still, and that would indeed be unfair. But even a few seconds that you ask them to stay put seems like punishment to these creatures bursting with energy. If they could have it their way, they would even poo on the run. Oh, wait a minute, they already do! Because of an inability to stay still, everything from feeding them to changing and even photographing them is a challenge. That explains why most of Little Dude's pictures are a blur. 3. Eating healthy - They do love food, but they can detect what we want them to eat and they automatically hate it. As babies, it's easy to feed purees of almost anything, but you can't be sneaky about broccoli and carrots as finger food. If they spy a cookie in the corner of the room (which you obviously didn't hide well enough), they'll want it and nothing else. 4. Shopping - Who in their right mind goes shopping with toddlers? Actually, we all have to because that's kind of part of the parenting package. Needless to say, no practical shopping happens with toddlers because they make it their mission to sabotage it. They just time their tantrums carefully so you just have to grab and go (and later regret your purchases). Grocery shopping is even worse because then they want to eat all the junk and play with the glass bottles. 5. 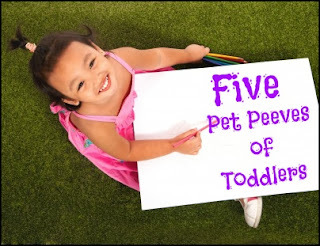 Playdates - Toddlers don't really have a problem with socializing but I think they secretly hate playdates because having other toddlers around steals their thunder. And also because toddlers are only grasping the speaking bit, and I imagine it's an uphill task having to converse with another toddler! That's why they like grown-ups and older kids better. And that's also why most playdates end in tears and tantrums. As the Secret Department for Research in Mystifying Toddler Behaviour is still figuring out, there's no winning against the little ninjas armed with the cutest smiles. As long as you have your battle gear on, you may still dodge the ketchup and spit missiles! What are your toddler's pet peeves? Let's share the knowledge! This post has been linked to The PINcentive Blog Hop at Cropped Stories, and Post Comment Love at Verily Victoria Vocalises. Yes, I have to agree my little guys are peeved with just about all of those! Haha! haha great list! I know some slightly older kids who still have some of these pet peeves! Glad you agree, thanks for stopping by! Really, that's interesting to know! Then, all I'll say is - lucky you! I hear you, that's exactly what happens to me! Thanks for stopping by.